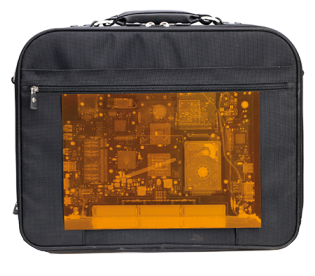 FLATSCAN30 panel offers a full 30″ diagonal imaging area with only a few millimeters of dead area at the bottom of the panel. It can be used in a wired configuration or it can set up its own WIFI for wireless connection to the controlling laptop. It can be wired to the CP series of x-ray generators or sets up it’s on Bluetooth network. Whether wireless or wired the operator can be looking at images of the x-rayed item within seconds of starting the scan. 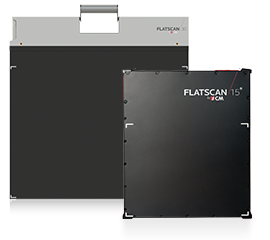 FLATSCAN15 is a more compact version having a 15″ diagonal imaging area. It also offers just a few millimeters of dead area at the bottom of the panel. Although it is smaller in size it offers the same wired and wireless options as the FLATSCAN30. FLATSCAN30 XS™ and FLATSCAN15 XS™ are now available. These models are slimmer, lighter, and have greater resolution than the original FLATSCANS. 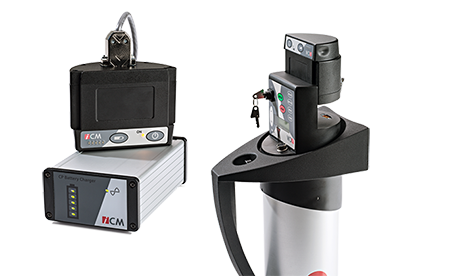 The CP120B and CP160B constant potential x-ray generators offer several technical and operational advantages over pulsed x-ray generators. The operator has complete remote control of: exposure, time, current (mA), voltage (kV), and pre-warming time of the generators. The CP120B (120 kV) and CP160B (160kV) are constant potential x-ray generators that offer a completely new concept; these are not pulsed sources with very limited life-time tubes. Rather CP sources are continuous wave sources – x-rays are generated continuously during the exposure time. These constant potential generators are capable of penetrating through 10 mm (CP120B) and 21 mm (CP160B) of steel in a very short exposure time and the small focal point affords better image resolution whether used with our Flatscan series of imaging panels, our PF self-developing films, or other manufacturers’ imaging panels. When standard x-ray imaging panels are too thick, PF films are the solution. These self-developign films slide easily between a suspect item and walls or other interferences. The PF films are self-developing (like Polaroid images) and require no additional software or equipment to cause the images to appear. PF films are available in a variety of sizes.